- Connecting communities of journalists with technologists sparks collaboration and sharing of ideas. Code for Africa is a Kenyan-based nonprofit organization that aims to achieve open data and open government on a continental scale. It is designed as a vehicle for partnerships, to allow for shared knowledge and collaborative solutions. Focus programs include: Data Liberation, Data Skills, Data Fellowships, and Data Tools all in the name of data-journalism. Teams are based in public tech hubs or incubators, called CitizenLabs, where citizens or journalists can walk in for help or to share space needed to build their own projects. One of the project’s essential to this case study is their partnership with Hacks/Hackers Africa. Code for Africa acknowledged the need to bridge journalists to technologists in order to make media more effective and accessible for all. Realizing that Africa itself is not a country, the organization has expanded to other countries like: South Africa, Ghana and Nigeria in order to create a greater regional impact. Founded in 2012 by Justin Arenstein, it hopes to use data-journalism to spark civic engagement and innovation in the future. As a continent, Africa, itself is seen as developing or ‘third-world’. Many countries have limited access to technology, specifically those in Sub-Saharan Africa. In 2007, “most internet [was] by low speed dial-up connections which are concentrated in Egypt, Kenya and South Africa. Faster speed broadband connections through Asymmetric Digital Subscriber Lines (ADSL) are found in South Africa, Egypt, Morocco and Algeria”. Sub-Saharan Africa lacks computer skill in all areas such as programming, maintenance, and all operational levels from basic use to management. Most countries lack the educational and training facilities. However, over the years there has been an increase in investments in information technology (IT). IT in Africa is being used for the importation and production of vitally needed information. “Information represents power in both the economic and political spheres…[As] African economies improve, they need to have access to the same markets and the same information within the same time frame as more developed countries”.Things included in information technology, like data and mobile technology, are now at a point where they can be used on a massive scale to help people access basic services and information. Media organizations can take advantage of this technology and properly give their audience actionable information to begin change. 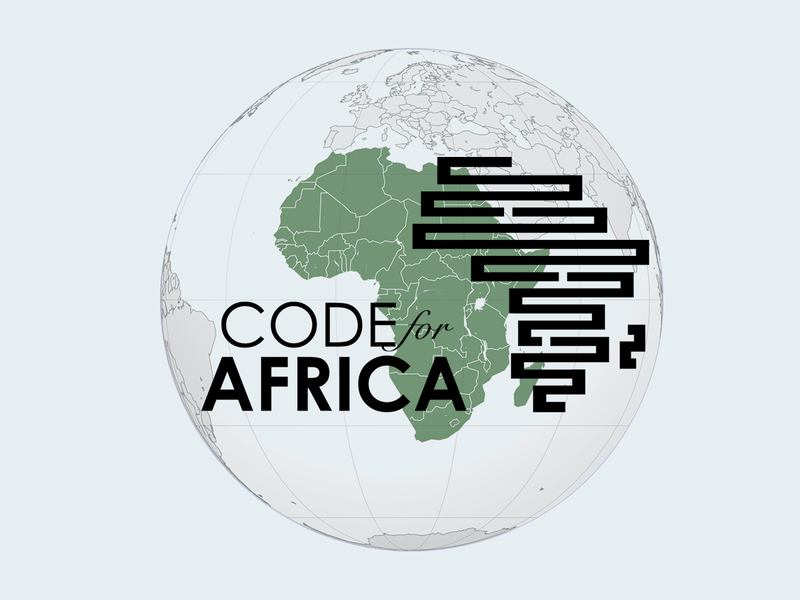 Code for Africa’s partnership with Hacks/Hackers Africa (HHA) aimed to bridge the gap between journalists and technologists in order to enhance data-journalism. Their mission is “to be an ideas catalyst, spreading knowledge, information and ideas”.The digital community of Hacks, also called journalists, and Hackers share information and collaborate to develop the future of media and journalism. Chapters bring together technologists, who are often seeking content, with journalists, who are looking for technological platforms, and data liberators who curate data of public interest. Traditionally, journalists have delivered the news in a type of “he said, she said” rhetoric. Their stories were not heavily evidence-based, which calls the need for collaboration with technology. Thus journalists can gain information that enhances their storytelling and engages their audience. In addition to improving journalism through open technologies, the partnership also used it as a means for efficient governance and increased transparency. The partnership funded and hosted two major events throughout the year: Code4Democracy and DataLiberation. Code4Democracy is a 48-hour, civic hackathon that brings together local technologists, journalists, and entrepreneurs to build web and software applications that will help make governments more accountable. The first hackathon was hosted in South Africa in 2012, inspiring a grassroots data-driven movement. “The application that can be accessible on a simple mobile device would help civil society to highlight issues like corruption in their constituencies, poor services and problems at school”. It empowers citizens, giving them the tools and information they need to make better-informed choices. There are currently 26 HHA chapters throughout Africa. Out of the 26, only eight are active meaning they have 30 members, frequent meetings, an executive committee, and an approved activity plan and budget. Both Code for Africa and HHA acknowledge that the best way to achieve change is to have local citizens come together, form and lead local chapters. However, there is the problem of garnering local support and interest needed to become an active chapter. In countries like Egypt, Senegal, and Zimbabwe charters are in an incubation/start-up phase where they do not meet the minimum member requirement or don’t have the leadership needed to become active. Although there is an HHA project team available to provide guidance and support, chapters rarely take advantage of it. Some members have claimed that the general HHA support cannot relate to country-related or cultural problems that are encountered in the chapters. The program included actors from both Code for Africa and HHA. Justin Arenstein, a director at Code for Africa, leads his team in their partnership with HHA. Additionally, he is “Project Champion”, or lead director, on Hacks/Hackers Africa team. Under him there are different community managers for: East Africa, West Africa, and Southern Africa. Within the different chapters, there are journalists and technologists who join to learn and collaborate. Each chapter then creates their own network within the local communities and form partnerships with other organizations as well. The chapters are often used as a space to think and bring to life projects and ventures. Which then involves the local citizens of the community, since empowering them is the end goal. The ideas and projects that come from this program not only improve local reporting but alsoinvolve the lives of residents. In addition to empowering inhabitants, the program wanted to increase government transparency. Which included from a legislature level to a public service level. The main group of actors is those participating in the HHA chapter, however the most important group of actors is those that these ideas are affecting and that is local populations. A problem observed by HHA members is the lack of unity amongst all HHA chapters since a majority is not active. This calls for HHA address new ways they can provide support to the local chapters that takes into account different cultures and political/economical climate. The program has been successful in their expansion throughout the continent of Africa. Both Code for Africa and Hacks/Hackers Africa started out in countries like South Africa, Kenya, Ghana, and Nigeria and since then has expanded together to 10 other countries. During my assessment I have observed a few areas in need of improvement in the program. The first is addressing the high number of chapters that are stuck in the incubation or start-up phase. This is due to lack of members or leadership needed to form an activity plan and budget. The general HHA is there for support but can only do so much from a long distance. A potential solution is a large workshop for chapter founders and leaders in a host country. In this workshop, directors of the program can review topics like: how to generate more interest, how to draft an activity and budget plan, and other program essentials to the local chapter leadership. In turn, the leaders can then create a dialogue amongst themselves on how to best implement these topics in their respective countries. Additionally, local leadership can talk to HHA headquarters, sharing culture and political/economic climate and how best to approach chapter requirements. This will then have HHA consider setting out chapter requirements that are country specific, in order to achieve a pan-African vision. Another area of improvement in the program is the inclusion of women, on both the journalists and technologists’ sides. There are few women in leadership positions in both Code for Africa and HHA. However, this does not solve the issue of lack of female participation in the program. This can be addressed by a few solutions one of them being marketing. Most of the marketing for the program is directed towards men, especially in the recruitment of technologists. The language used, on their website and in local marketing, is gender neutral however where it is advertised is key. Mostly in local universities where in certain African countries, women are least likely to be. Not all women who have an interest in journalism or technology are attending local universities; therefore their marketing needs to be more accessible to the local female residents. The work done thus far by the program has been incredibly affective and admirable. It has improved the access to data, increased knowledge, and improved local journalism. On the other hand, it has also pointed out the areas that could be improved. If the issue for Code for Africa and HHA is their limited resources, then it would be best to reach out to their major partners: The World Bank, Google, and the International Center for Journalists. They are all heavily invested in data journalism, open data, and government transparency and would be willing to invest more in order to help the program achieve its maximum capabilities. If not them, then the program has the network and resources to reach out to other national and international organizations that can help as well. It is important to act on these recommendations because it strengthens the overarching goal of a regional impact and a pan-African vision. "Technology Infrastructure and Services in Africa." - African Economic Outlook. N.p., n.d. Web. 14 Dec. 2015. "Information Technology in Sub-Saharan Africa." Information Technology in Sub-Saharan Africa. University of Pennsylvania, n.d. Web. 14 Dec. 2015. "HacksHackersAfrica/wiki." GitHub. N.p., n.d. Web. 14 Dec. 2015. "Computer Geeks Unite for Open Society." IOL. CapeTimes, 06 Aug. 2012. Web. 14 Dec. 2015. "Sub-Saharan Africa: Strengthening Storytelling & Audience Engagement through Data Journalism & Civic Innovation | ICFJ - International Center for Journalists." Sub-Saharan Africa: Strengthening Storytelling & Audience Engagement through Data Journalism & Civic Innovation | ICFJ - International Center for Journalists. N.p., n.d. Web. 14 Dec. 2015. "Open Data & Open Government Are Revolutionary." Code for Africa. N.p., n.d. Web. 14 Dec. 2015. "Information Technology in Sub-Saharan Africa." Information Technology in Sub-Saharan Africa. University of Pennsylvania, n.d.